Well, it was finally time to head south for my first Southern Cascades ski odyssey of 2004, trying to hit a bunch of the OR and CA volcanoes before this spring's high pressure and heat wave finishes off the snowpack. My first destination was Newberry Volcano, the largest volcano (by volume) in Oregon and the 2nd largest in the entire Cascades, trailing Medicine Lake Volcano but larger than Mount Shasta. The top of the broad shield of Newberry has collapsed to form a 5-mile wide caldera, known as Newberry Crater, which contains 2 lakes and a variety of obsidian flows and cinder cones. The circumnavigation of the caldera rim is a very scenic 22-mile trip with 3500 ft of gain/loss by the shortest route, but I've never seen it listed in any ski guidebook (yet). The route is easily done in a day on cross-country skis, but I used my alpine touring gear since that's all I have, thus making the trip somewhat more of a workout. Most of the route follows groomed and marked snowmobile trails, but luckily I had waited until the snowmobile season had just about ended, so I saw no snowmobiles (and no people) all day, but could still enjoy the easy travel of the groomed route. Ten Mile Sno-Park at 5560 ft was almost snow-free, but continuous snow started within 500 ft of the car. Snowdepths in the caldera (6300+ ft) and along the rim (7000+ ft) were generally about 3-4 ft. Leaving just after 8am, I skinned up the hard frozen snow of Trail 11 into the caldera at the outlet of Paulina Lake, and then followed Trail 4 upward along the north rim. This trail passes mostly through open forest with occasional views of the caldera, eventually reaching its 7520 ft high point at a saddle just below North Paulina Peak. The route soon descends along a mile-long lava flow north of the caldera rim, and then climbs back up to the rim, reaching Cinder Hill Viewpoint on the NE side above East Lake. This provides the most spectacular view of the caldera and lakes along the entire route. By now, the sun had softened the snow enough that skins were unnecessary and I did the remaining 2/3 of the route on bare skis, while occasional cloudiness kept the snow from ever turning to mush. I followed Trail 4 back into forest as it turned south to eventually join Trail 1 at the SE edge of the caldera. A short jaunt west on Trail 1, then south on Trail 2, brought me to the poorly marked junction with Trail 500 (aka Lost Lake Trail), an ungroomed route which heads west just inside the south caldera rim. Just 1/2 mile along this trail, a variant of the circumnavigation route heads SW along the unmarked Crater Rim Trail to reach Paulina Peak, at 7985 ft the highest point on Newberry. This variation adds about 2 miles and over 1000 ft of gain to the route, but I had skied Paulina Peak before, so I decided to stick to the standard route. I followed Trail 500 up a hidden valley to reach the broad plain of Pumice Flat at 7100 ft and then the upper edge of the Big Obsidian Flow, by far the largest of Newberry's numerous obsidian flows. The ski descent along the western lobe of the flow provided the only real downhill skiing of the day, a fine run on very nice corn in a rugged setting, skiing between glistening black towers of obsidian rising above the surface of the flow, with views down to Paulina Lake and across to the Three Sisters and Mount Bachelor. I dropped down the steep edge of the flow near 6600 ft to reach Trail 5, following it NW to rejoin Trail 1 just south of Paulina Lake. This was the homestretch, taking Trail 1 back west to hit Trail 11 for the long downhill glide back to the Sno-Park. The clouds building during the day managed to squeeze out a few raindrops on this last bit, but not enough to make anything wet. I reached the car before 6pm, completing the long but very scenic ski tour in under 10 hours (including numerous stops). This view looks southwest across Newberry Crater from the Cinder Hill Viewpoint. 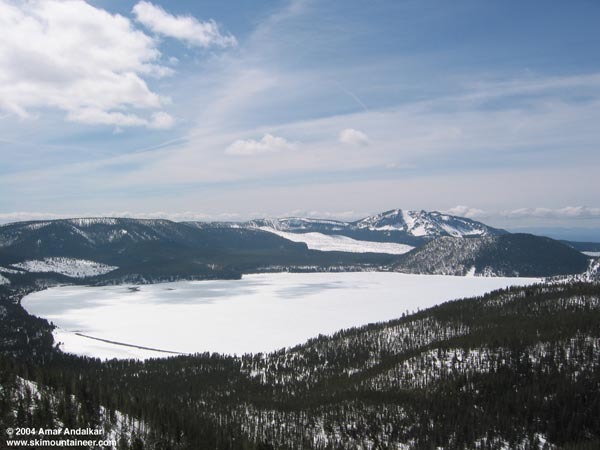 The frozen East Lake is in the foreground, with the snow-covered Big Obsidian Flow beyond and Paulina Peak rising above in the background. Click here for a double-size version of this photo.